Maple Comics is new kid in town. Maple Comics is a publishing company that produces comics and illustrated works. The first work they published Kuala Terengganu in Seven Days, written and illustrated by Mimi Mashud. 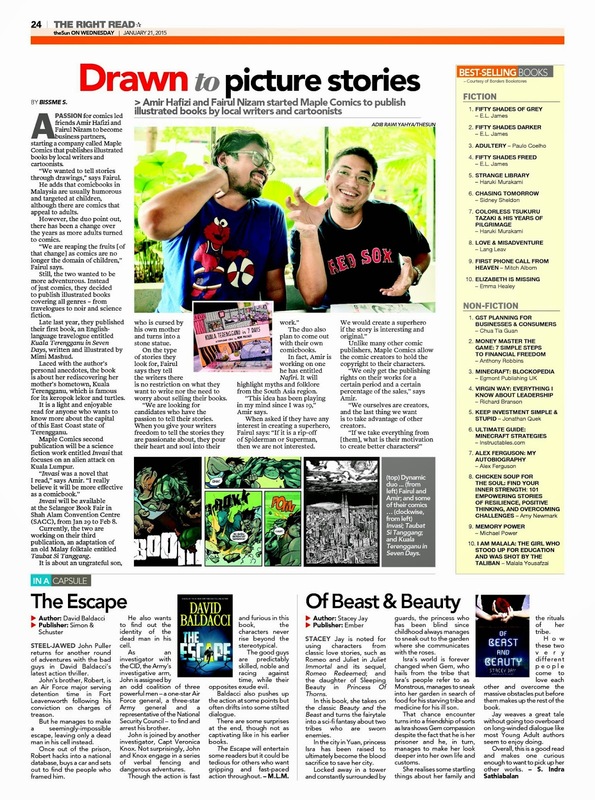 A passion for comics led friends Amir Hafizi and Fairul Nizam to become business partners,starting a company called Maple Comics that publishes illustrated books by local writers and cartoonists. “We wanted to tell stories through drawings,” says Fairul. He adds that comic books in Malaysia are usually humorous and targeted at children, although there are comics that appeal to adults. However, the duo point out, there has been a change over the years as more adults turned to comics. “We are reaping the fruits [of that change] as comics are no longer the domain of children,” Fairul says. Still, the two wanted to be more adventurous. Instead of just comics, they decided to publish illustrated books covering all genres – from travelogues to noir and science fiction. Late last year, they published their first book, an English language travelogue entitled Kuala Terengganu in Seven Days, written and illustrated by Mimi Mashud. Laced with the author’s personal anecdotes, the book is about her rediscovering her mother’s hometown, Kuala Terengganu, which is famous for its keropok lekor and turtles. It is a light and enjoyable read for anyone who wants to know more about the capital of this East Coast state of Terengganu. Maple Comics second publication will be a science fiction work entitled Invasi that focuses on an alien attack on Kuala Lumpur. “Invasi was a novel that I read,”says Amir. Invasi will be available at the Selangor Book Fair in Shah Alam Convention Centre (SACC), from Jan 29 to Feb 8. Currently, the two are working on their third publication, an adaptation of an old Malay folktale entitled Taubat Si Tanggang.It is about an ungrateful son,who is cursed by his own mother and turns into a stone statue. worry about selling their books. “We are looking for candidates who have the passion to tell their stories. When you give your writers freedom to tell the stories they are passionate about, they pour their heart and soul into their work." The duo also plan to come out with their own comicbooks. In fact, Amir is working on one he has entitled Nafiri. It will highlight myths and folklore from the South Asia region. “This idea has been playing in my mind since I was 19,” Amir says. Unlike many other comic publishers, Maple Comics allow the comic creators to hold the copyright to their characters. “We only get the publishing rights on their works for a certain period and a certain percentage of the sales,” says Amir. The first work that Maple Comics published.